Foladi-Mahani, S., Yaghoubi, S., Hosseini-Motlagh, S., Nematollahi, M. (2018). Order quantity optimization in a two-level pharmaceutical supply chain. 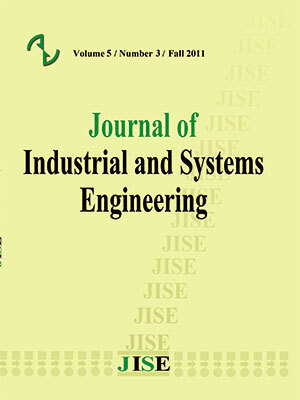 Journal of Industrial and Systems Engineering, 11(1), 127-146. Sayeh Foladi-Mahani; Saeed Yaghoubi; Seyyed-Mahdi Hosseini-Motlagh; Mohammadreza Nematollahi. "Order quantity optimization in a two-level pharmaceutical supply chain". Journal of Industrial and Systems Engineering, 11, 1, 2018, 127-146. Foladi-Mahani, S., Yaghoubi, S., Hosseini-Motlagh, S., Nematollahi, M. (2018). 'Order quantity optimization in a two-level pharmaceutical supply chain', Journal of Industrial and Systems Engineering, 11(1), pp. 127-146. Foladi-Mahani, S., Yaghoubi, S., Hosseini-Motlagh, S., Nematollahi, M. Order quantity optimization in a two-level pharmaceutical supply chain. Journal of Industrial and Systems Engineering, 2018; 11(1): 127-146. Drug has a great and crucial role inboth the health systems and the quality of life, and thereforeits shortage can cause death.In order to the important role of drugs,pharmaceutical supply chain(PSC) shouldensure that drugs are delivered to people in the right time with the best quality.On the other hand, thesupply chain (SC) members depend on each other for resources and information, and it has increased in recent times due to outsourcing, globalization and rapid innovations in information technologies. This increase brings some extent of risk and uncertainty along with benefits for them and so, SC coordinationis a crucial issue. Thispaper studies a PSCmodel witha single active pharmaceutical ingredientsand a single finish pharmaceutical product. For this purpose, decentralized and centralized structures are investigated. Then,a coordination mechanism is developed based on the buyback contract in order to encouragethe SC members to make decision by considering each other's profit to simulate the condition of decentralized SC versus centralized one.In order to demonstrate the effect of the proposed coordination model, numerical examples and sensitivity analysis are provided. The results show that by applying buy back contract, in coordination structure the order amount of raw material and the profits of the pharmaceutical supply chain will increaseso it can effect on the amount of manufacturing orders.By using buy back contract, the profit of each SC member increasesin comparison with the decentralized decision-making structure. Devangan, L., et al., Individually rational buyback contracts with inventory level dependent demand. International Journal of Production Economics, 2013. 142(2): p. 381-387. Heydari, Jafar, Kannan Govindan, and Amin Jafari. "Reverse and closed loop supply chain coordination by considering government role." Transportation Research Part D: Transport and Environment 52 (2017): 379-398. Heydari, Jafar, Mehdi Rastegar, and Christoph H. Glock. "A two-level delay in payments contract for supply chain coordination: The case of credit-dependent demand." International Journal of Production Economics (2017). Heydari, Jafar, Tsan-Ming Choi, and Saghi Radkhah. "Pareto improving supply chain coordination under a money-back guarantee service program." Service Science 9.2 (2017): 91-105. Heydari, Jafar, Mansour Mahmoodi, and Ata Allah Taleizadeh. "Lead time aggregation: A three- echelon supply chain model." Transportation Research Part E: Logistics and Transportation Review 89 (2016): 215-233. Heydari, Jafar, and Javad Asl-Najafi. "Coordinating inventory decisions in a two-echelon supply chain through the target sales rebate contract." International Journal of Inventory Research 3.1 (2016): 49- 69. Heydari, Jafar, and Yousef Norouzinasab. "Coordination of pricing, ordering, and lead time decisions in a manufacturing supply chain." Journal of Industrial and Systems Engineering 9 (2016): 1-16. Heydari, Jafar. "Coordinating replenishment decisions in a two-stage supply chain by considering truckload limitation based on delay in payments." International Journal of Systems Science 46.10 (2015): 1897-1908. Heydari, Jafar, and Yousef Norouzinasab. "A two-level discount model for coordinating a decentralized supply chain considering stochastic price-sensitive demand." Journal of Industrial Engineering International 11.4 (2015): 531-542. Heydari, Jafar. "Supply chain coordination using time-based temporary price discounts." Computers & Industrial Engineering 75 (2014): 96-101. Heydari, Jafar. "Coordinating supplier׳ s reorder point: A coordination mechanism for supply chains with long supplier lead time." Computers & Operations Research 48 (2014): 89-101. Hogerzeil, H.V., Essential medicines and human rights: what can they learn from each other? . B World Health Organ, 2006. 84(5): p. 371–5. Hojati, Sara, et al. "Coordination and profit sharing in a two-level supply chain under periodic review inventory policy with delay in payments contract." Journal of Industrial and Systems Engineering 10 (2017): 109-131. Jaberidoost, M., et al., Pharmaceutical supply chain risks: a systematic review. DARU Journal of Pharmaceutical Sciences, 2013. 21(1): p. 69. Johari, Maryam, Seyyed-Mahdi Hosseini-Motlagh, and Mohammadreza Nematollahi. "Supply Chain Coordination using Different Modes of Transportation Considering Stochastic Price-Dependent Demand and Periodic Review Replenishment Policy." International Journal of Transportation Engineereing 5.2 (2017): 137-165. Johari, M., and S. Hosseini-Motlagh. "Coordination of cooperative promotion efforts with competing retailers in a manufacturer-retailer supply chain." Uncertain Supply Chain Management 6.1 (2018): 25-48. Kaufmann, L., C. Thiel, and A. Becker, Supply chain management in the Mexican pharmaceutical industry, in 16th annual research/teaching symposium on purchasing and supply chain management. North American. Nematollahi, M., et al., Economic and social collaborative decision-making on visit interval and service level in a two-echelon pharmaceutical supply chain. Journal of Cleaner Production, 2017, 142(4): p.3956–3969. Nematollahi, Mohammadreza, Seyyed-Mahdi Hosseini-Motlagh, and Jafar Heydari. "Coordination of social responsibility and order quantity in a two-echelon supply chain: A collaborative decision-making perspective." International Journal of Production Economics 184 (2017): 107-121. Privett, N. and D. Gonsalvez, The top ten global health supply chain issues: Perspectives from the field. Operations Research for Health Care, 2014. 3(4): p. 226-230. Shah, N., Pharmaceutical supply chains: key issues and strategies for optimisation. Computers & Chemical Engineering, 2004. 28(6–7): p. 929-941. Sundaramoorthy, Arul, and I. A. Karimi, Planning in pharmaceutical supply chains with outsourcing and new product introductions. Industrial & engineering chemistry research 43.26 (2004): p. 8293-8306. Wang, Y., et al., Service supply chain management: A review of operational models. European Journal of Operational Research, 2015. 247(3): p. 685-698. Wei, J. and J. Tang, Analysis on the Stackelberg game model and risk sharing based on buyback contract. Journal of Theoretical and Applied Information Technology, 2013. 48(2): p. 1025-1031. Yanhong, Q., Y. Yaxian, and W. Guangxing, Buyback contract Considering Fairness Preference under the frame work of Nash-Bargain in a two Stage Supply chain. International Journal of Engineering Research and Application 2013. 3(3): p. 1298-1305. Xiong, H., B. Chen, and J. Xie, A composite contract based on buy back and quantity flexibility contracts. European Journal of Operational Research, 2011. 210(3): p. 559-567. Yan, N., Dynamic Models and Coordination Analysis of Reverse Supply Chain with Remanufacturing. Physics Procedia, 2012. 24: p. 1357-1363. Yao, Z., S.C.H. Leung, and K.K. Lai, Analysis of the impact of price-sensitivity factors on the returns policy in coordinating supply chain. European Journal of Operational Research, 2008. 187(1): p. 275-282. Zhang, N. and Z. Fang, A Literature Review on the Supply Chain Coordination of the Buyback Contract 3rd International Conference on Education, Management, Arts, Economics and Social Science. 2016.